Most transnational metropolises have embedded within them sites of ancient civilisation, as well as youthful and moving urban centres and peripheries. While Baghdad struggles in the midst of war to protect and renew its literary, archaeological and architectural heritage, Cairo attempts to balance political and religious tensions within a dynamic cultural life. In some urban centres, including Damascus and Beirut, the structures of future heritage have been overridden by rapid and incomplete development, and/or the devastation of war. Cities such as Dubai and Abu Dhabi are promoting a new urban cultural policy on a tabula rasa, by importing and creating spaces for the arts and housing a selection of international art institutions such as the Guggenheim and the Louvre within the Saadiyat Islands, for example. New Ends, Old Beginnings investigates a number of artist responses to the complex strata of everyday life in these cities and the stories emerging from them. Some of the questions the selected artists raise are: What aspects of urban culture can be salvaged or shared? In what ways can legacies co-exist with current and future cultural practices? What constitutes authenticity both in general and in view of newly created cultural hubs? What kind of tourism is associated with or possible in the cities of the Arab region? The exhibition attempts to make visible some of these issues, while considering the practices involved in perceiving, maintaining and re-evaluating heritage via contemporary art practices. 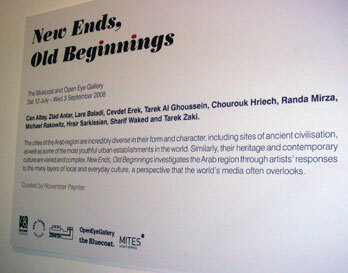 Considering the questions above, the works included in New Ends, Old Beginnings reveal features of, and engage current responses to, the situation of cultural heritage in the Arab region. Works included in the exhibition have been carefully selected and commissioned to reference the specific themes of heritage, cultural industry and tourism, as well as the possibility for art to translate the daily realities of changing urban life. Hence, the title Old Ends, New Beginnings aims to signify a shift from habitual, linear ways of apprehending space, cities, and change. Comprised of photography, drawing, video and sculptural installation, the exhibition was presented across two Liverpool venues, the Bluecoat and Open Eye Gallery. Artists Can Altay and Lara Baladi presented works in both venues creating a dialogue between the sites and allowing different perspectives for the viewer.